The manner in which the Faizabad sit-in was ended and the terms of the agreement signed by the Government with protesters through the corroboration of the Army – all mark a disappointing watershed in the history of Pakistan. That the Army, tasked by the Federal Government, facilitated an agreement that capitulated the State to demands of a mob has all but disastrous connotations written all over it. 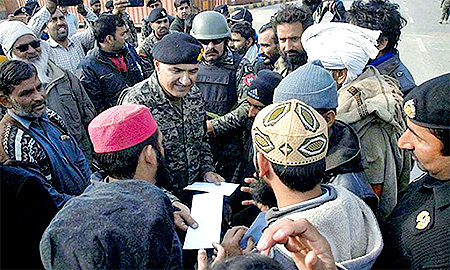 Subsequent statements by the leader of the protest and actions, such as the DG Rangers distributing cash amongst dharna protesters, have not only raised serious questions about the writ of the Government and the State but also about the role of the Armed Forces during the protest. The agreement brokered by the Army and signed by the Federal Government, specifically thanks the COAS and his team for their facilitation. Not surprisingly, therefore, almost nationwide criticism and condemnation was offered on the Federal Government signing an agreement that compromised the writ of the State. The agreement was termed as a complete capitulation to a mob, with serious questions raised on the role of the Armed Forces on its facilitation of an agreement that weakened the writ of the Federal Government and the State. This dharna has raised very serious questions with grave implications for the stability of the State. All Pakistanis owe it to their country to not only ask these questions but also contribute to the search for right answers to these questions. The Constitution clearly defines all the rules of the game on democratic governance of the homeland. Multiple power centres, resorting to dharnas and weakening the writ have to have an end. The Election Bill, 2017 was introduced as a Government Bill in the National Assembly. The Election Bill, 2017 was passed by the National Assembly. Senate made a small amendment to Election Bill 2017, and passed the bill. Senator Hafiz Hamdullah of Jamiatul-Ulema-e-Islam (F) pointed out changes in the Nomination form of the candidates, but the House rejected the move by the Senator to prevent the change. The amended bill went back to the National Assembly for approval. The Election Bill 2017 was passed by the National Assembly, replacing the original “I solemnly swear” with the words “I believe” in a clause relating to a candidate’s belief in the finality of the prophethood of Prophet Muhammad (Peace Be Upon Him) ─ the Khatm-e-Nabuwwat oath. The Bill was signed into Act by President Mamnoon Hussain the same day. After raucous by politicians and media, The Elections (Amendment) Act 2017 was passed by the National Assembly after restoring Khatm-e-Nabuwwat oath to its original form (“I solemnly swear“). The Senate passed it the next day. Raja Zafar ul Haq Committee was formed in the PML-N by Mr. Nawaz Sharif to identify those responsible for the controversial amendment. Raja Zafar ul Haq Committee dispatched its report to Mr. Nawaz Sharif, who was in London. A rally of TLYRA and Sunni Tehreek Pakistan started from Lahore with a host of demands, including removal of Federal Law Minister Zahid Hamid and Punjab Law Minister Rana Safiullah; Asiya Bibi’s execution, cases against religious leaders to be dismissed and the removal of clerics from the Fourth Schedule. Federal Interior Minister ordered Islamabad administration to defer the operation for 24 hours so the matter can be resolved peacefully. Supreme Court took Suo Motu notice of the sit-in. - A media blackout ensued where all T.V. News channels were blocked for airing the operation live. Social Media websites were also blocked. - By afternoon it had become clear that the operation launched by the Islamabad Capital Administration to remove the protesters from the sit-in site at Faizabad had miserably failed. Police had to retreat and the sit-in continued. - Later, Federal Minister for Interior wrote to requisition Pakistan Army, but the Army, demanded more clarity. The issues were addressed, as Minister Iqbal later told Justice Siddique in the IHC. A high level meeting was called by the PM attended by the COAS, CM Punjab and Interior Minister, in which Chief of Army Staff reportedly opposed the use of Army to forcibly end the 19 day long sit in at the Faizabad interchange. In the meeting with Prime Minister, he opposed the Army’s use of force against its own people since the population’s trust in the institution of the Army “can’t be compromised for little gains.”  It was decided in the meeting that Pakistan Rangers, not the Pakistan Army, will be deployed to deal with the protestors. Major General Azhar Naveed Khan, DG Rangers (Punjab) was appointed as the over-all in-charge of the operation to handle and clear the sit-in. Islamabad and Punjab Police were put under the command of Rangers for one week. 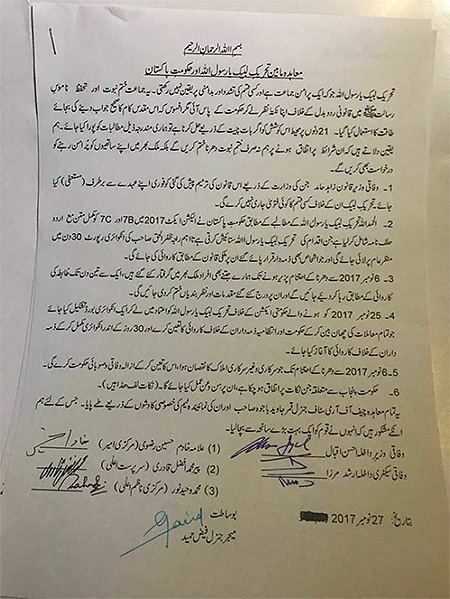 - Government gave in to demands of protestors, which included resignation of Law Minister, release of all arrested protestors, cases against them dropped, as well as compensation for loss to any government or private property incurred from November 06 till the end of dharna, to be provided by Federal and Provincial governments. During a hearing on the Islamabad dharna IHC Judge Shaukat Aziz Siddiqui lambasted the Interior Minister for seceding “civilian supremacy.” He raised issue with the Army acting as an arbitrator. Dharna of members of TLYRA that had been taking place since November 25 at Faizabad, ended on December 01, 2017. The protestors were demanding resignation of Rana Sanaullah, MPA and Punjab Law Minister, alleging that he had made comments in favour of Ahmedis. According to agreement a committee will be formed regarding resignation of the Punjab Law Minister. 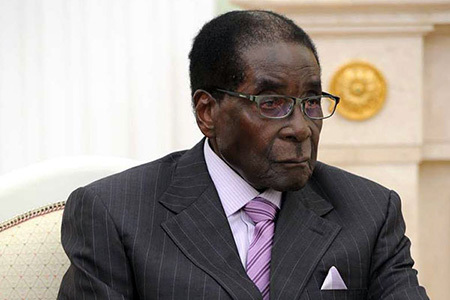 Calls for his resignation from several quarters still persist. 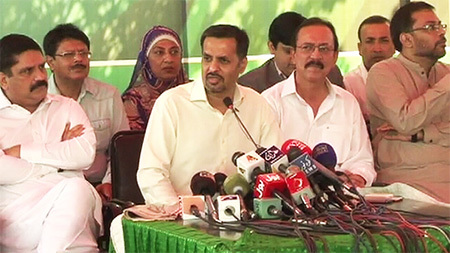 Previously, on November 08, 2017 both Kamal and Sattar had announced, in a jubilant press conference, to form a political alliance, where Kamal had made it clear that the alliance will be named “anything but MQM.” The two parties had announced to join under one party, one manifesto, and one symbol. However, on November 09, 2017, Sattar called another Press Conference saying that, although their alliance with PSP was still intact, MQM-P would contest elections under its own symbol and manifesto. Pakistan has experienced a dark history with dire consequences of establishment’s political engineering maneuvered in the shape of PML-Q by Major General Ihtasham Zamir; IJI claimed to have been created by Lt. Gen. Hameed Gul; and MQM facilitated as a counterweight to the Pakistan Peoples Party in Sindh under General Zia’s martial law. Apart from PSP-MQM-P alliance, serious questions are raised on the role of the establishment in undermining and ousting Mr. Nawaz Sharif, to now pressurizing the PML-N government. Similar past experiences exist of pre-election, election-day and post-election meddling and manipulation. If this flagrant violation of Constitution and rule of law has indeed taken place, proper legal proceedings should be instituted to hold the responsible persons to account otherwise it will raise critical questions on the future of democratic governance in Pakistan. Reportedly, the COAS, in a letter addressed to the Prime Minister, pointed out that military courts had not received any terrorism-related cases since January 2017. This resulted in the Federal Cabinet clearing 29 cases to be referred to Military Courts. Federal Minister for Interior, Mr. Ahsan Iqbal, also told the media that 80 more cases were pending approval by the Cabinet and “after this, the Interior Ministry will not have any more cases pending,” he said. The formation of the Military Courts in January 2015 was made possible by the Parliament when it passed the 21st Constitutional Amendment, 2015 (that had a sunset clause of two years and later reconstituted for another two years in January 2017) after the Peshawar Tragedy. The Federal and Provincial Governments have so far failed to reform the justice system so that military courts are not required to deal with the terrorism cases. If the Government is not forwarding the cases to the military courts in time and the COAS has to remind the Government on this count, it indicates a sorry state of efficiency in the Government. 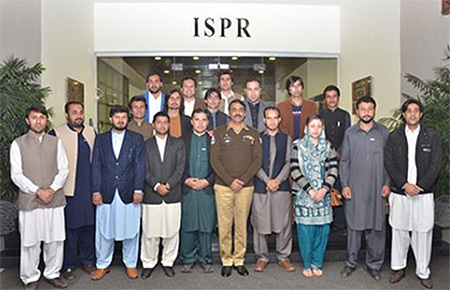 Given the centrality and importance of the 20-point consensus-based National Action Plan (NAP) in countering terrorism in Pakistan, PILDAT has undertaken a citizens’ initiative to monitor the progress of implementation of the NAP. PILDAT Quarterly Monitors report progress based on publicly available data in order to promote fact-based discourse on the progress in implementing NAP. While PILDAT has repeatedly asked the ISPR to provide provincial and federal data on number of cases received and tried by Military Courts, the ISPR has not been forthcoming in sharing the required data to allow assessment of the important NAP point number 1 of Implementation of death sentences of those convicted of terrorism. Federal Government may do well by compiling and releasing a periodic progress report on the implementation of NAP. While military efforts for development in problematic areas, such as Federally Administered Tribal Areas are quite commendable, there is a need for the Government to take an active interest in the governance, and development of these areas which are cleared by the military. 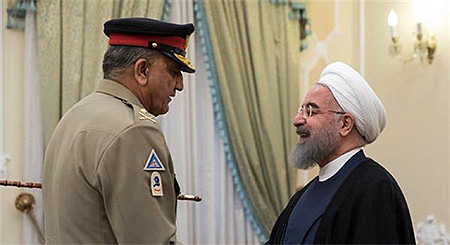 COAS General Qamar Javed Bajwa meeting Iranian President Mr. Hassan Rouhani at the Iranian Presidential Palace on November 06, 2017. Top Left: US Ambassador David Hale with the COAS; Top Right: Chinese Special Envoy on Afghan Affairs Mr. Deng Xijun with the COAS; Bottom Left: Mr. Kong Xuanyou, Assistant Foreign Minister and Special Envoy on Korean Peninsula Affairs of China, with the COAS; Bottom Right: Mr. Sadik Babur Girgin, Turkish Ambassador to Pakistan, with the COAS. On November 21, 2017, Mr. Kong Xuanyou, Assistant Foreign Minister and Special Envoy on Korean Peninsula Affairs of China, and Mr. Yao Jing, newly appointed Chinese Ambassador to Pakistan, called on the COAS at the GHQ to discuss matters of regional security. Commander 10 Corps, Lieutenant General Nadeem Raza, met and appreciated young sportsmen of the football team of Mirpur, who won 12th Open All Russia Football Competition – Future Depend on You- 2017 held at Moscow from October 25 – 28 2017. The Commander ‘appreciated achievement of the young children and assured support for their training and assistance. On November 17 2017, 250 students and faculty members from Institute of Business Administration Sukkur, Shah Abdul Latif University, Khairpur, and Degree College Pano Aqil, spent a day at Panu Aqil Garrison to experience the routine functioning of the Pakistan Army. The students witnessed arms and equipment display, small arms firing at ranges and a demonstration on action by Quick Reaction Force. 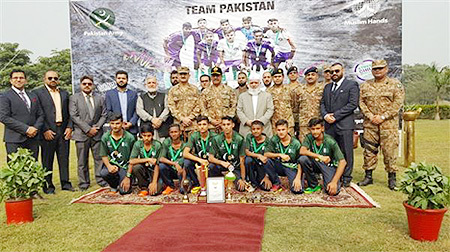 An Inter-University Cricket Tournament organized by the Pakistan Army concluded on November 28, 2017. Provincial Sports Minister Mir Mujeeb Ur Rehman Hasni, Vice Chancellors of all the universities of Balochistan, and senior Army and Civil Officers came to watch the matches. Commander Southern Command Lt. Gen. Asim Saleem Bajwa gave away prizes to the winners of the tournament. Chaired by Prime Minister Shahid Khaqan Abbasi, a National Security Committee meeting took place in Islamabad on November 15, 2017. Earlier, the meeting of the National Security Committee had taken place on September 08, 2017. 1. On November 10, 2017 Prime Minister Abbasi, along with COAS Bajwa, visited the Line of Control (LoC) in Chirikot sector of Azad Jammu and Kashmir (AJK). The Prime Minister was briefed about the situation of the LOC, as well as Indian cease-fire violations targeting civilians. The PM met families of Shaheeds and injured due to Indian shelling, and condemned Indian atrocities. Meeting with troops, he appreciated their efforts and sacrifice to protect the nation. Federal Minister of Defence was not present on the occasion. 2. Premier Abbasi and COAS Bajwa also met during the National Security Committee (NSC) on November 15, 2017. 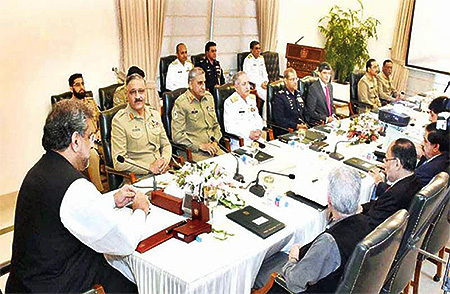 Chaired by the Prime Minister, the meeting was attended by NSC members including Federal Interior Minister, Mr. Ahsan Iqbal, MNA, Foreign Minister, Khawaja Muhammad Asif, MNA, Chairman of the Joint Chiefs of Staff Committee, General Zubair Mehmood Hayat, Army Chief, General Qamar Javed Bajwa, Naval Chief, Admiral Zafar Mahmood Abbasi and Chief of the Air Staff ACM Sohail Aman. Federal Minister of Defence was not present on the occasion. 3. Premier and COAS also met on November 27, 2017 to review the law and order situation in the country, and develop a strategy to deal with the protestors at Faizabad. The meeting was attended by Chief of the Army Staff, General Qamar Javed Bajwa, Inter Services Intelligence (ISI) Director General Naveed Mukhtar, Punjab Chief Minister, Mr. Shahbaz Sharif, MPA and Federal Interior Minister, Mr. Ahsan Iqbal, MNA. The Federal Minister of Defence was not present on the occasion.